Australian Institute of Health Innovation (AIHI) at Macquarie University conducts world-class research with national and international research communities, governments, policymakers, providers of health services, managers, clinicians, patients and the community. Our work underpins health reforms and systems improvement, providing new tools, perspectives and evidence to help stakeholders who are interested in making the health system more effective, efficient and productive. Our overarching aim is to produce new, high quality research evidence to support change, prevention and improvement. The AIHI secured funding for DUQuA as part of NHMRC Program Grant (APP1054146). 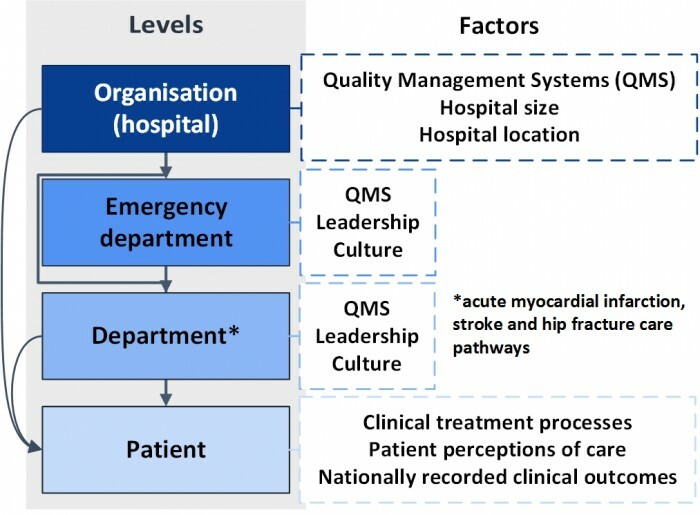 DUQuA is an extension of a study undertaken to deepen the understanding of healthcare quality in Europe, DUQuE, which examined the relationships between quality management systems (QMS), clinical processes, and patient outcomes in 188 hospitals across seven countries (Czech Republic, France, Germany, Poland, Portugal, Spain, and Turkey). A DUQuE supplement (open access) was published in the International Journal for Quality in Healthcare, Volume 26 suppl 1 April 2014. The DUQuA protocol was published in BMJ Open. Read the open access article here. 1. What department level factors are associated with processes and outcomes for stroke, acute myocardial infarction (AMI), and hip fracture patients? 2. What hospital level factors (including Emergency Department factors) are associated with processes and outcomes for stroke, AMI, and hip fracture patients? How much does each factor contribute to the total variation in outcomes? To ensure that this study is relevant and feasible, our researchers consulted with clinicians, researchers and healthcare organisations who have shared their expertise about healthcare delivery in Australian hospitals. See our stakeholders page for key contributors to our project.